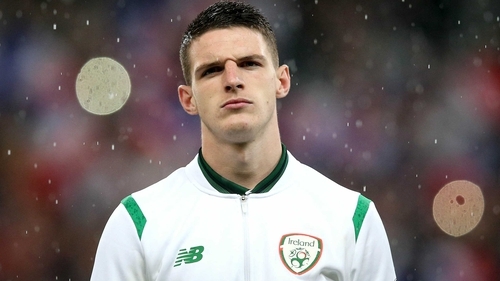 Declan Rice has informed the FAI of his decision to pursue an international career with England, despite earning three senior caps for the Republic of Ireland. Rice's international future has been the subject of much speculation since his breakthrough with West Ham and England manager Gareth Southgate held talks with the midfielder, in an effort to get him to switch from Ireland. Rice, who qualified for Ireland through his grandparents, played three senior international friendlies for Ireland in 2018 having previously represented Ireland at underage level. All of Rice's three senior Ireland appearances came during 2018, including games against France and the USA ahead of the World Cup. However because he never featured in a competitive game, he was free to change his allegiance to the country of his birth. Rice confirmed his decision in a statement which read: "This has been an extremely difficult decision and, in all honesty, not one I ever expected to be making at this stage of my career. "So much has happened, so quickly, in the past couple of years, from progressing through the West ham Academy to making my Premier League debut at the age of 18 in 2017 and then being named in the full international squad just two days later." Rice said he was "truly grateful" for the support he has received in coming to his decision and insisted it was never a black and white decision. "Like so many people around the world, I consider myself to be of mixed nationality. I am a proud Englishman, having been born and raised in London. However, I am just as proud of my family’s Irish heritage and my affinity and connection with the country. "Ultimately it is a personal decision that I have made with my heart and my head based on what I believe is best for my future." Meanwhile Ireland manager Mick McCarthy wished Rice luck in his career: "Declan rang me today and said he has decided to give it a go with England. Good luck to him, it is his decision and his decision alone and I wish him well with his international career in the future. "That is not to be. I never got the chance to work with Declan so he is not my player and won’t be now that he has made up his mind."